Born in Newcastle, Australia, Daniel Johns is a vocalist, composer, guitarist, pianist and producer best known as the frontman of Silverchair, one of the most acclaimed and successful bands in Australian music history. He is also one half of The Dissociatives alongside Australian dance guru Paul Mac, and he is the only person to win APRA&apos;s prestigious “Songwriter Of The Year” Award three times. Silverchair have won more ARIA Awards than any other artist and they have enjoyed more #1 albums than any other Australian band. During his remarkable career Daniel has continually explored new musical territories and he is currently working on a film project titled My Mind&apos;s Own Melody which he has created with writer and director, Josh Wakely. 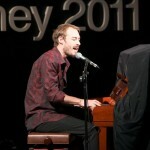 Daniel & Josh will be talking about their collaboration at TEDxSydney 2011.